Lauding India’s democratic tradition for its progress, Bangladesh Prime minister Sheikh Hasina on Saturday sought cooperation from neighbouring nations to protect her country’s youth from the scourge of conflict, terrorism, and narcotics. “We are an independent country gradually moving towards progress. We haven’t been as lucky as India which has enjoyed a democracy tradition for which they could progress,” she said after receiving an honorary Doctor of Literature degree from the Kazi Nazrul University here in West Bengal’s Paschim Bardhaman district. She said her country wanted youth to lead a better and meaningful life. “We want to protect our youth from conflict, violence, terrorism, militancy and narcotics. We want the youth to lead a beautiful, better and meaningful life. I want cooperation from our neighbouring countries on this count,” said the Bangladesh Prime Minister. 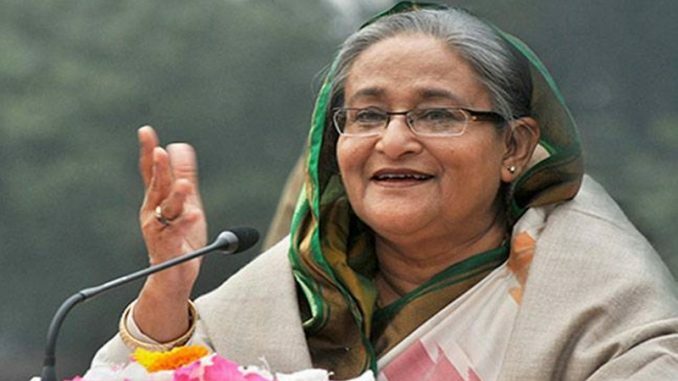 Stressing that her country wanted the Indian subcontinent to be free from the perils of hunger and poverty, she said: “While formulating our plans and programmes to ensure further development, we dont’ think about Bangladesh only. Apparently hinting at India, she said earlier Bangladesh had lot of problems with its neighbouring country. Hasina recalled India’s contribution in Bangladesh’s liberation war, as also in building an independent Bangladesh. Expressing her country’s indebtedness to then Indian Prime Minister Indira Gandhi, she said “she stood beside us”. A nostalgic Sheikh Hasina went back to the events of August 15, 1975, when 18 members of her family including her father and then President Sheikh Mujibur Rahman were assassinated. She remembered how Gandhi gave shelter in India to her and her sister Sheikh Rehana who had survived as they were abroad during the killings. “Both of us were in Germany as refugees when Mrs Gandhi brought us and gave shelter in the country. She had helped many others who were tortured, heckled, by the dictators and provided them shelter. We are grateful for always having you all by our side,” she added.